We gratefully acknowledge the support of our members whose advertisements appear throughout this publication. Whilst every care has been taken in compiling this publication and statements it contains, neither to the promoter involved or the publisher can accept responsibility for any inaccuracies for the products or services advertised. The opinions expressed in Demolition and Dismantling do not necessarily represent those of The National Federation of Demolition Contractors including its officers and members. The past four months have been extremely busy across a wide range of sectors. In the height of summer, the talk of the month I am delighted to report is the great success of this year’s Demolition Expo and send my sincere gratitude and congratulations to all involved in the production to make it such an outstanding event to raise the profile of our industry. It was a joint venture of two of our established organisations within the UK, the National Federation of Demolition Contractors (NFDC) and the Institute of Demolition Engineers (IDE) as they came together for a meeting of minds at the event. The Demolition Expo was an opportunity for the ISP members of the NFDC to showcase the equipment and services they have to offer and how they can benefit the corporate members in delivering the projects they undertake. It was an occasion to network between the NFDC and IDE and education from the half a day seminar. All of which helps to develop relationships to benefit towards the future of the demolition industry. contribution from all of the organisers of the event. It was fantastic to see such enthusiasm and engagement with both the NFDC and IDE for the success of the Demolition Expo 2015. A special mention to John Mould who transformed his property for the good will of the event- your contribution is greatly appreciated. On behalf of both our corporate and ISP members, we continue to offer competitive solutions using innovative techniques, whilst primarily considering both cost and risk. We continue to promote within the NFDC for the benefit of those members, including full page advertising in Construction News, Demolition & Dismantling magazine and of course in addition to our Demolition Expo event. Developing the skill set our workforce can offer and using innovative techniques to complete complex projects, is an aspect of progression our members aim to achieve. Without the specialised equipment our ISP members have available, the continuous evolution of our industry which comprises of such talent would not be possible. It is important to celebrate and promote all areas of success and emerging alterations within the NFDC to industries which we respect and admire. Communication is key as we illustrate these for the benefit of all our members and we consider our industries future within the UK and to our competitors within the global market. The NFDC Convention 2015 is being held at the picturesque Slieve Donard Resort and Spa in County Down, Northern Ireland from the 4th to the 7th September. All federation members are invited to join for the occasion which is situated in six acres of immaculate private grounds bordering a beach and with the world renown Royal County Down Golf Course in a close proximity. The convention is a great benefit to all members which is a further networking opportunity whilst being educated by the main sponsor Sandvik at their factory in Ballygawley. The NFDC’s half yearly business meeting is being held at the factory where attendance by our federation members is paramount. I look forward to seeing many if not all of our members joining us as we celebrate successes and strengths of the federation and come together to develop our future. As a previous President of the NFDC, Tom Greenham has seen great changes in the demolition industry since he joined in 1957. The Greenham name has been present in the London demolition industry from 1850 with Tom taking the reigns of the family firm of London Demolition in 1957 upon the death of his father. “The demolition industry has been very good to my family over the years” explains Tom “We have undertaken some very interesting projects during my time working in the industry including the demolition of the famous Intercontinental Hotel in central London. As an authoritative voice for the demolition industry, The National Federation of Demolition Contractors (NFDC) have been keeping a keen eye on the recent changes to the Construction, Design, Management Regulations, CDM 2015.
on the wearing of hard hats on demolition sites. While this was initially frowned upon by the unions, it was the start of the push by the demolition industry to be recognised as industry leaders in looking after the welfare of their operatives. The one thing that Tom fondly remembers about his time within the industry was the camaraderie between fellow demolition professionals especially the late Claude Brown and Peter Griffiths, both of whom were prominent members of the NFDC and IDE. Even though he has now retired from the industry, Tom still keeps a watchful eye on proceedings with his son running the family firm of London Demolition UK Ltd.
demolition industry as to the changes. The key change in the CDM Regulations 2015 is the dropping of the CDM Co-ordinator role created under CDM 2007, a role currently frequently contracted out to a third party consultant, and the introduction of the Principal Designer who will be drawn from the project design team. The structural simplification of the regulations and the replacement of the Approved Codes of Practice with a more targeted guide will hopefully make the regulations easier to understand. To assist members with the upcoming changes to CDM the NFDC are currently in the progress of drafting an updated Guidance Note for Members. MATTERS PURCHASE OF VITALIA HOUSE The National Federation of Demolition Contractors (NFDC) and National Demolition Training Group (NDTG) are pleased to announce the purchase of Vitalia House in Paradise Industrial Estate, Hemel Hempstead. The building will soon be the new home for the NDTG to undertake demolition, health and safety and construction related training. Currently the NFDC and NDTG share the adjacent Resurgam House but an increase in enquiries from the demolition and construction industry for specific training has prompted the group to look at expansion. The NDTG offer a wide variety of course subjects for all levels of the demolition industry from general site operative through to demolition management. General construction safety course are also offered along with tailored demolition plant training including high reach excavator and skid steer loader. Courses can be held at the NDTG premises in Hemel Hempstead or at clients own premises if required. The NDTG issued over 12,000 certificates to successful candidates in 2014 and the expansion into Vitalia House will provide a significant increase in these figures for 2015.
circulation thanks to a large increase and updating of the database with the magazine now being sent to more relevant bodies within the demolition, construction, recycling and wider industries. developed for distribution throughout the architectural and construction industries to highlight the benefit of using an accredited NFDC demolition contractor. The pack will contain details of the commitment to training, technical competence and dedication to client satisfaction. For more information on the NFDC and membership please contact Louise Calam, louise@demolition-nfdc.com. Friday 4th - Monday 7th September All Federation Members are invited to join us at this picturesque resort in County Down, Northern Ireland. WHERE’S HOWARD? WE FOLLOW THE NFDC CEO AROUND THE COUNTRY structures along the proposed route. While the meeting focussed on the benefits of using Federation members, HS2 cannot guarantee that only our Members will be able to tender for such projects. While this can only happen in a transparent and just marketplace, HS2 were very keen to embrace the standards set by the NFDC for their members and have agreed to set out certain criteria for demolition companies to meet when such work becomes available. been kept busy over recent months attending both the Regional Meetings and various other NFDC and NDTG functions. While Howard is kept very busy with Federation matters, he also goes out to the wider industry to promote the work and ethics of the Federation and its Members. The Regional Meetings have been reported as very positive. With ever increasing turnout from Member companies, Howard is keen to encourage Regional Chairmen to push for more involvement from local members. While attempting to attend every meeting on the calendar there have been occasional clashes with Howard offering his sincerest apologies for being unable to attend. response being overwhelming. Facebook and Twitter comments were up hugely and traffic to the website also went up dramatically with many people calling for a second series. Funding for the NDTG is always a hot topic. Howard and the team have recently secured additional funding from the CITB and have negotiated a deal to reduce the costs for Managers, Supervisors and Chargehand courses to NDTG Members. The recent announcement of a merger between UKCG and NSCC.has raised concern at Federation board level. Despite a high level meeting with NSCC CEO Suzannah Nichol several questions remain unanswered. While details are still up in the air, Howard is still determined that the UK demolition industry will have a presence and maintain a voice within this important group. One final undertaking over the recent months has been the talk of workers cards from CSCS. There are rumours regarding changes to the system and the possible introduction of smart card technology for affiliated cards and while this may be something in the future, the NFDC and NDTG will be keeping its Members informed of any changes in the industry. recently completed one of the largest and most complex demolition projects undertaken in the city of Edinburgh for many years. The buildings were located on the junction of St Andrew Square and South St David Street, and overlooked the very popular St Andrews Square, right in the very heart of the bustling capital. The former mixed use buildings had lain dormant for almost a decade since Dem-Master originally undertook the soft strip out of the building. The soft strip was not the first time the company had been involved with the buildings having undertaken some facade retention works almost 25 years ago. Dem-Master Managing Director, Peter Speedie explains that his company had undertaken the strip out contract of the buildings in readiness for demolition for a previous client. The demolition was postponed for numerous reasons with the building staying empty until last year when Bowmer and Kirkland were appointed to redevelop the city centre site. facades including granite and glass cladding designs and were situated in very close proximity to hotels and office blocks which were to stay in use during the demolition works. Another problem the Dem-Master team had to deal with was the partial listing of some of the buildings. While this caused temporary delays in commencing operations, client discussions with the relevant authorities eventually saw the buildings de-listed. Although not a quick decision, the Dem-Master team were able to work around these obstacles until the delays were fully resolved. machinery into the site. Following a number of night time demolition sessions, the company had opened up enough space on the site top allow the Hitachi to remain on site and commence daytime operations. The first operation for the Hitachi was to lift four mini excavators to the roof of the ten story building along with a Brokk demolition machine to commence the deconstruction of the building. The structural integrity of the building had been checked prior to the mini excavators being lifted up and with sufficient tolerance in the imposed loadings available, the demolition work commenced at pace with all mini excavators and skid steer loaders quickly reducing the building down to six stories. While the company had intended to bring the building down with the high reach machine, the lack of full time road closures meant the rethink of their operations. The top down operation was a more time consuming affair for the demolition team but the ability to alter their method of demolition was much appreciated by the client. The proximity of basement structures also meant that positioning of heavy equipment over the demolished buildings required careful consideration. With many of the basements being retained along with a number of retaining walls, a series of structurally designed temporary fill solutions and temporary propping works needed to be designed and installed. This was also true of some of the listed structures where a large amount of temporary steelwork was designed and installed to ensure the structure remained stable. Once the de-listing of the buildings came into force, the steelwork was removed for the demolition work to progress. The scaffolding subcontractor used for the job was required to have a presence on site from the start of the demolition works as was the pace of the demolition. â&#x20AC;&#x153;We needed scaffolding to be moved constantly during our operations.â&#x20AC;? explained Mr Speedie. the small courtyard to the rear of the buildings. With a 28 week programme to meet, the company also brought in two Liebherr R954, one a 28m high reach, and two Hyundai 225 excavators to assist in both the demolition and material removal. With the site being centrally located, the company decided to remove the material to the nearby docks at Leith for crushing and screening as any operation of this type on site would have slowed the overall progress up and also created potential noise and dust issues. The potential problems created by both noise, dust and vibration were taken into account at he start of the job with a number of remote monitoring systems installed to constantly monitor all levels and automatically report should levels near their limits. Dem-Master and their clients are proud to say that there were no breaches of any noise, dust or vibration limits at any time during the demolition phase of the operations with the noise of passing traffic and trams creating more disturbance than the demolition itself! The relatively tight demolition programme was further compressed as the client required part of the site to become available for construction work to commence after just 16 weeks. Working a series of shifts, Dem-Master provided Bowmer and Kirkland with the portion of the site which they required to enable them to commence their operations and actually completed the full demolition package two weeks ahead of schedule. While the majority of the demolition work involved raising the buildings to the ground, one of the structures required to the granite facade cladding to be removed for potential reuse on the new structure. To facilitate this, Dem-Master used a number of large cherry pickers to remove the granite panels before numbering, protecting and putting them into storage. With the majority of the building stripped out prior to the demolition contract commencing, Dem-Master are looking to recycle almost 100% of the demolition arisings with a small amount of material coming back onto the site to provide a piling mat for the construction operations. Even though the project threw a number of curve balls at Dem-Master with extra structural bracing having to be installed and subsequently removed due to delisting and the lack of road closures meaning a change in methodology, the company completed the highly complex and awkward project within their allowed programme time to the complete satisfaction of Bowmer and Kirkland. Both Senior Project Manager, Craig Paterson and Senior Site Manager, Phil Bates were extremely pleased with the way in which Dem-Master approached and completed the project. So successful was this complex project that Dem-Master have been awarded with the British Safety Council International Safety Award and has helped them to the Construction News Demolition Specialist of the Year Award. We are the proud owners of the UKâ&#x20AC;&#x2122;s tallest demolition rig. Our Liebherr R984C stands at 70m and is ready to tackle the biggest jobs throughout the UK. the M1, M6 and A14 roads and is currently under reconstruction by Skanska in a major push by the Highways Agency to alleviate the hold ups and accidents caused by the huge amounts of traffic using the junction. The weekend of the 21st of March saw the busy junction on the UK motorway network brought to a stand still, albeit temporarily, while demolition specialists Armac deftly removed a now redundant bridge over the M6 North access junction. The bridge was once part of the Southbound carriageway of the M6 and since the road realignment work had been underway, this portion of the carriageway had been unused. To facilitate the further construction of the structures for the new section of road, the bridge was in need of demolition. The decision to blast the structure was one made on time scales. While Armac have the know-how and equipment capable of removing the bridge, the need to re-open the Northbound M6 slip road as soon as possible was the defining factor in this decision to blast. the 10pm blast was put back an hour causing a few nervous moments for the Armac crew who were already on a tight schedule. The Highways Agency had demanded that the access road be back in operation by 2pm on the Sunday afternoon meaning Armac, from their original 10pm blast time, had only 16 hours to drop and clear the bridge. added task of breaking up an almost complete deck. running some of their smaller Hitachi Zaxis 225USLR machines with the system for a number of years. It has been the solid build quality and ultimate cost savings associated with running OilQuick equipped machines that has led them to equip the rest of their heavy demolition fleet with the system. “We have looked at the figures for purchasing the OilQuick system and retro fitting it all of our attachments and although it is substantial, the longterm benefits far outweigh the initial cost.” comments Mr McLean. One of the company’s Hitachi Zaxis 225USLR machines was present on the job but was used in a support role with the major demolition works being carried out by five Volvo EC380DLC excavators, a pair of Caterpillar 345CL and a pair of Hitachi Zaxis 470LCH excavators. The main demolition excavators were assisted by a Volvo EC250D and three Volvo A30F articulated trucks used to ferry material to stockpiles. Also on site was a Caterpillar 966G wheeled loader used with forks to move some of the large demolition attachments around the site and a bucket to aid in the stockpiling of the concrete arisings. has become ultimately safer. There is no leaking oil from fittings contaminating the ground, nobody has to leave the cab risking slips or trips. If all these factors are put together with the speed of operation and use of the correct tool at all times, the longterm cost savings can easily be identified. While there are some “Industry Professionals” who still say the use of an OilQuick or tilt rotator attachment is not a necessary attachment, it is easy to see just why there are so many people coveting such attachments. While there may be an additional cost associated with the purchase of such equipment, the long term benefits for both man and machine cannot be overlooked. There have been over 10,000 OilQuick units sold around the world and it is the robust construction and simplicity of design of this, along with similar systems, that has led to an upsurge in their popularity. While the cost conscious UK market always lags behind our European counterparts, we are now embracing the benefits of fully hydraulic quick coupling systems and it will be interesting to follow the growing trend over the next few years. has passed its final sentence; its own death penalty! The building along with an admin building and link-bridge will be demolished to make way for a new civic centre. The existing civic centre will then be demolished to make way for future development of the town centre. from bank to bank before boarding it out to protect it from any falling debris. attachments. The company also used the services of a Caterpillar tele-handler and a JCB Robot skid steer for undertaking the menial fetching and carrying jobs on the project. While the project threw up some interesting challenges for the company, the project was completed on time and to the total satisfaction of the client. awarded Demo One Ltd the SHE Managers Special Recognition Award for their standard of work while carrying out the demolition of five fire stations in London and the South East. Following the appointment by Kier, Demo One undertook demolition of stations in Leytonstone, Purley, Dockhead, Dagenham and Shadwell as part of a private finance initiative (PFI) funded programme that will deliver nine new fire stations across London. All of the structures included drill towers of up to five storeys and due to their urban locations within built-up environments required controlled deconstruction techniques which Demo One specialises in. The demolition of the Dockhead station will be particularly poignant as it was ‘Blackwall Fire Station’ for many years in the ITV series London’s Burning. Built in 1928, the threebay station which was developed to include a small film studio, will be replaced by a new, three-storey building and will include facilities for the local community. residential, construction and services group which invests in building maintenance and renews places of work and housing. provide hot water and high levels of insulation. Demo One, which specialises in deconstructing high-rise and citycentre structures, was assimilated into the McGrath Group in 1991. “Over the last 6 months you have completed the demolition work in a safe manner in accordance with the requirements of the programme,” said Malcolm Burton, Contracts Manager at Kier Construction. “It has been a pleasure meeting and working with you and your teams. Let’s hope we can develop this relationship further going forward on other projects”. The world’s finest brands d provided by the UK’s most exp perienced, dedicated attachment specialist. t Buy, hire or service any a attachment with industry-leading supp s ort and unbeatable product e expertise. pecialist demolition contractors Erith Group have recently made a significant investment in new plant and equipment to add to their already extensive fleet, including Hitachi Zaxis excavators ranging through various models in the 3050 ton class. Erith Group Director Dave Darsey was insistent that all the new demolition spec machines purchased were to be fitted with the OilQuick automatic quick coupler system supplied and installed by Warrington based attachments specialists ECY Haulmark. Having made the move initially to OilQuick back in November of 2013 Erith have since been reaping the benefits the OilQuick systems has to offer, in terms of safety for the site, operators and the increased productivity by no longer having to spend time manually changing between attachments. Come Spring of 2015 Erith Group now have nineteen of their machines fitted and operating with OilQuick. working on a six month project in Garston, Liverpool dismantling a redundant gas holder. Matthew added, without the ability to make the attachment changes so quickly this project would have taken much longer to complete or seen the need for more machines working inside of the chamber. Erith Group Managing director David Darsey commented “We initially took the OilQuick system on a two month trial demonstration in 2013 on one of our Hitachi 280 excavators and then subsequently purchased the system. On that machine I’m pleased to say, since the OilQuick system has been on we have been totally satisfied with its performance to date carrying out heavy demolition activities using various attachments, not one hose has been replaced. Since then we have purchased a further eighteen units. This is a testament to the quality of the OilQuick product, together with a great after sales back up from ECY Haulmark. Demolition Expo 2015 proved to be the UKâ&#x20AC;&#x2122;s most exciting demolition weekend. was used on demonstrations around the working area. ECY Haulmark offer their customers a wide range of attachments from LaBounty, Furukawa, VTN and Dynaset along with the OilQuick hydraulic coupling system. The OilQuick was being demonstrated on a PR Plant Doosan excavator and was wooing the crowds with its safe and speedy attachment changeovers. The company also had a RubbleMaster compact crusher on static and demonstration which was proving very popular. Worsley Plant made a major announcement on the Friday revealing ex Kocurek General Manager, Brian Carroll was starting with the company to spearhead a drive in to the Southern Counties and manage a new depot around London. Like ECY, Worsley are heavily pushing the fully automatic quick coupling system with the German Lehnhoff system. The company had examples fitted to a number of excavators which were working away demonstrating the range of Rotar shears, processors and selector grabs and MB and Remu crushing and screening buckets. Hydraulic Attachment Services and MST were also present along the working area. HAS showed off the range of Italmek pulverisers and shears which they are sole UK distributor for along with their Blade Supermarket range of replacement shear blades. LDH attachments were also on site with their range of Dehaco selector grabs and hammers. Motley Plant were displaying their range of fixed strut grapples and pulverisers along with an Indeco hammer. The company are also dealers for the Kinshofer and Demarec range of hydraulic attachments of which they had many examples on show. The ProDem range of attachments and hammers were on display alongside the Arden range of hydraulic attachments with Miller GB showing their range of heavy duty attachments and couplers. Neil Grainger from Always Digging who walked away with the prizes kindly donated by JCB and Armac. There were three other awards with John Mould winning the best vintage vehicle, Worsley Plant for the best stand and Sandvik for manufacturers innovation. The crushing and screening area was filled with a variety of jaw crushers from Sandvik who were proudly displaying a new QJ 241 jaw crusher sold to Armac along with a QJ341 from Tyne Tees Crushing which was feeding a three way split screen. Kleeman were demonstrating their Mobirex MR110Z mobile tracked crusher with additional screenbox while Blue Group were showing a Premiertrack 400 jaw crusher feeding into a Warrior 2100 finger screener. The final demonstration machine in the crushing and screening area was a from Anaconda. McCloskey equipment were showing a number of static screens and crushers on their stand. Husqvarna were showing their range of demolition robots alongside one of their end-users, Gnat-UK. The popular range of compact yet powerful machines were being showing with a variety of attachments including hammers and from Gnat, rock and metal saws. John Moore Tractor Parts enjoyed the show with excellent enquiries for their range of cutting edges and GET. The Saturday was a fun-filled family day with the landtrain in operation taking children and adults for rides around the site and a whole host of activities for the youngsters. The crowds also enjoyed the 4x4 and Volvo ADT course as well as the day long demonstrations from the attachment and crushing manufacturers. The excellent weather brought out the crowds in huge numbers with almost 3000 visitors on the Saturday alone, close to 5000 over the two days. Such was the large attendance and support from both the manufacturers and industry representatives that many exhibitors were already asking about the possibility of a show in two years time. 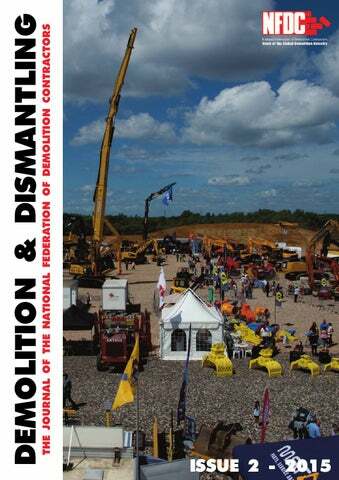 Both the NFDC and IDE would like to extend their gratitude to all involved in the organisation of the show especially John Mould and his workforce, Duncan Rudall and Adrian McLean who worked tirelessly in the organisation along with the many members of staff from both camps who have put a greta deal of effort into making Demolition Expo 2015 the huge success it was. Thank you to RPA Design & Media for the photos and video. Thank you to Inmalo for sponsorship of the photos and video. FORSHAW D DEMOLITION OF THE WOODFORD AERODROME earmarked for demolition on the With the site laying dormant for a Woodford Aerodrome on the first phase. The demolition would number of years due to the outskirts of Manchester has had a very important part to play in the history of the Royal Air Force and in the manufacture of some of the most famous aircraft in British history. The former private airfield was originally opened in 1924 by the AVRO company and became an important production centre for military aircraft during the Second World War with notable aircraft such as the Avro Anson, Avro Lancaster, Avro Shackleton and the iconic Avro Vulcan being manufactured at the site. The site then went on, under different owners, to produce the Hawker Siddeley Nimrod before, after 80 years of aircraft manufacture, being sold off in 2011.
then encompass the remainder of the site which included more modern office accommodation and smaller workshop space. taken apart in large pieces so as to reduce the possibility of creating dust particles. With the sheeting safely removed with no contamination to the surrounding area, the teams concentrated on the removal of the steel frame of the buildings. Aiding labourers with the clean up of the sheeting were a team of skid steer loaders. The speedy and effective way in which the loaders dealt with the material meant that any sheeting hitting the ground didn’t stay around for long before being transferred to skips. the large open span of the hanger buildings meant sections were carefully collapsed in order for the material to be cut into manageable sections. The fleet of excavators included the company’s flagship Komatsu PC800 equipped with short boom and extension arm wielding a Verachtert shear and a handful of 38 and 42 tonne Doosan excavators. As the initial phase of operations was very on a very tight timescale, the fleet of machinery quickly processed the material once on the ground and loaded it on to bulkers for recycling. As the developer was looking to start construction works very quickly to meet the local demand for housing, the first hanger and some smaller associated buildings were being cleared to a certain point before the team went back to remove the concrete slab and foundations which was then crushed and stored on site for the developers future use. Yet again Forshaw demonstrated their commitment to achieving their customers’ requirements with the ability to provide the correct equipment thanks to their impressive plant holding. Not only was the first phase of the demolition works undertaken in total safety but the time constraints put on the company were also met with the site handed to their client on time. 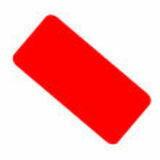 is key in the industry. Every time you work with the company, you will directly support the activities of the charity, whilst knowing that your waste will be dealt with responsibly and diverted from landfill; they recycle up to 100% of what they process. What’s more, with all of these great benefits, they can still offer you the best prices. Soon, fulfilling your CSR obligations will be a necessity to ensure that you stay competitive – but it doesn’t have to be difficult or expensive. Simply by choosing Recycling Lives, your business can get ahead, and easily adopt a social and environmental CSR strategy to tell your customers about. he NDTG were recently asked to take their state-of-the-art demolition simulator along to Ipswich based demolition conversion specialists Kocurek. Along with providing bespoke training to the demolition industry, the NDTG have been able to tailor a general health and safety on demolition sites course for some of the staff at Kocurek. Lead Trainer, Iain Kirk delivered the course to the fitters and managers likely to be involved with any site activities before moving on to offer staff a generalisation on operation of the high reach machine through the simulator program. The NFDC/NDTG demolition plant simulator gives novice operators a chance to operate either a high reach demolition machine or standard excavator in ultimate safety and with no risk of damage or injury to other parties. workshops, the day on the simulator offered them an insight into the difficult nature of operating a high reach machine in site conditions. More information about the demolition plant simulator can be found at www.ndtg.training. held two customer demonstration days at Reigart Demolition’s recycling centre in Scotland. The well attended event gave demolition, recycling and earthmoving industry professionals the opportunity to see close up machinery in action and if the correct tickets were presented, gave them the chance to test the machinery out themselves. Sandvik brought along three items from their large range of crushing and screening ranges with the QJ 341 tracked jaw crusher, a QE341 three-way screener and a small QE140 screen to complement the array of machinery brought along from Liebherr and also supplied by hosts, Reigart. On the demonstration plots a customer owned LH30M MultiUser was being used to full effect. The Multi-User concept combines the base wheeled material handler with straight material handling boom and short, excavator style dipper stick. While the materialhandling boom offers the reach required when stockpiling material or loading high–sided tippers, the dipper stick offers the machine true versatility. Fitted with a Liebherr Likufix hydraulic quick coupler the operator is able to swap attachments over in seconds with this example being supplied with a five-tine scrap grab, magnet and MSD1500 rotating shear. The attachments can be swapped over in under 30 seconds from the safety of the cab and provide the end user with a single machine capable of performing a multitude of tasks quickly and safely. with 6.8m straight boom and full cab guarding. The 40t tonne machine was effectively using a fixed strut muncher manufactured by ECY Haulmark to remove masses of steel reinforcement from lumps of concrete. Utilising the full power of the host excavator, the fixed strut muncher provides a low cost, reliable option to hydraulic versions. Two smaller excavators were present during the demonstration day, the R922and R914 Compact. Both machines were being used to load the Sandvik QJ341 and QE341 respectively and both generated a lot of interest during the two-day event. The R922 coming in for particular praise from Reigart’s operator who claims the machine is the best he has ever driven. The final machine came from Liebherr’s very popular range of fuel-efficient wheeled loaders. The L556 is a 14t machine with bucket capacities ranging from 3.6 to 10.0m3. Powered by a 140kW engine, the Liebherr benefits from a hydrostatic drive system that offers a high power to weight ratio along with reduced fuel burn. The L556 on demonstration was equipped with a set of industrial lift arms. The industrial lift arm is available as an alternative to the standard Zbar linkage and gives parallel lift arrangement along with offering greater torque in the upper lifting range, which is ideal when using larger attachments. Running around the site feeding the Sandvik QE140, cleaning around the crusher and larger screen and loading road-going trucks with material, the L556 proved very popular with its operator and the visitors alike. and Castle in London is currently undergoing major transformation thanks to large financial investment from the UK Government and European Union. One of the largest projects to be undertaken in the area was the demolition of the housing stock situated around Deacon Way and Heygate Street where main contractor for the demolition and remediation works Keltbray demolished over 1000 units over a three year period. Keltbray were appointed to remove the 1960s flats and maisonettes to make way for future housing redevelopment in the area and worked very closely with Southwark Council and Transport for London to undertake the massive project with as little disruption to the local community as possible. and reports all dust present in the air and can send text message alerts to site staff, should the levels exceed a prescribed point. With protective measures in place and the scaffolding erected, work to strip the asbestos form the flats could commence. While a small amount of asbestos board was found in each property, the bulk of the asbestos containing material was found in artexed ceilings to every property. It was the close co-operation with Keltbray Environmental Services who undertook the removal of the contaminated material, that the project moved along so quickly. blocks with a high reach excavator. This method of operation was deemed safe as the risk of collapse had now been removed. Working from the gable ends towards the centre, the blocks were systematically reduced at an angle, again to reduce the possibility of potential failure. and the subsequent cleaning of the ground. As Keltbray carry their own comprehensive labour force, the company also entered into the Section 106 agreement with Southwark Council and have employed a number of operatives from the locality giving them training including Demolition Awareness, Asbestos Awareness and getting them to obtain relevant CSCS card accreditation. While employing over 30 local individuals and businessâ&#x20AC;&#x2122; for the duration of the contract the company has put itself in the position to increase its core workforce for forthcoming projects with many of the individuals still employed by the contractor and now working of other projects in the Capital. At the time of our visit the company were in the final throes of the project with a small amount of demolition left to undertake along the site boundary. One excavator was still employed crushing some of the final hardstanding whilst another was laying a temporary road with some of the previously crushed materials on one part of the site while on the Heygate Street site the company were using some of their plant fleet to undertake the removal of footings from the final block of flats. A pair of Caterpillar excavators were removing the heavily reinforced concrete prior to processing. The company had also installed full wheel-wash facility on both sides of the site in an effort to reduce the amount of mud carried on to the street by the trucks leaving the site. have improved on their two previous Bronze site awards by receiving a Silver award for a project in Chichester carried out in the second half of last year. This is the third year running they have received one of these prestigious awards. The scheme was created to improve the image of the construction industry and their banners are seen on the best run sites in the country. The Surrey based contractor was rated as being exceptional in the areas of Site Safety and Appearance and were deemed excellent in the other categories such as Environment, Community and Workforce. shop and a restaurant so particular sensitivity was needed in the amount of noise and dust so as not to cause disruption to the neighbours. To this end a block work wall was specially constructed by SDC Ltd to protect the camera shop that was relocated to the former entrance to the arcade. This site was also selected by the contractor to be the location for the annual NFDC Site Audit which received accreditation for the excellent standards of safety, working methods and management. Site Manager Tom Egerton received the award in a presentation in London with SDC Managing Director Paul Hunt. They are already in discussions on further improvements they can make to try and bag a coveted Gold award next year! CSCS CARDS HELP MCGEE’S DESIRE TO REVOLUTIONISE SYSTEMS efficiency and improve safety by developing bespoke mobile applications to simplify time consuming paper based processes, McGee is using CSCS smartcards to automate checking and recording workers’ identity, qualifications and training. McGee Group, the broad based construction company and multidisciplined specialist contractor, is using android phones and tablets to scan CSCS smartcards both to check that the cards are valid and store the information held on the cards in its cloud-based database. Being cloud-based means that authorised site managers and administrators across McGee’s operations may access the information held to verify workers’ records and confirm that they have the correct qualifications to carry out their work on site. whenever authorised users need it.” This is one of a series of bespoke mobile applications developed for McGee in partnership with Mobilengine, which specialises in creating apps that mimic companies’ business processes in order to improve them. specialists Windmill Group have recently been undertaking a series of strip out works at the University of Leeds. The Worsley Building is home to the University’s medical school and works in close co-operation with that adjacent Leeds General Infirmary and many other medical practices around Leeds. Windmill’s contract was to undertake the removal of all internal fixtures, fittings, walls and ceilings in preparation for a full refit. While this may seem to be a run of the mill project, the remainder of the building was to stay in constant use and occupation during the operation. Access to the work area was also very limited with only a 4m2 goods lift providing access for all plant and materials. and a single stair core providing personnel access and a suitable fire escape. Add to that the floor in question was the sixth and you can see why the contract was a little more interesting. stair cores providing any internal support to the slab. The sixth floor was once home to the medical research department and contained a myriad of small rooms all constructed from breeze block with many housing strong steel cages. The cages were present from the floor’s former use as an animal research centre yet had been redundant for many years. Once the initial survey of the floor had been undertaken and a small amount of notifiable asbestos removed, the company set about installing temporary protection to the lift, stair wells and access corridors along with undertaking the complicated and timeconsuming service disconnections. Initial thoughts for the removal of all the waste arisings would have been to build a suitable rubbish chute down to the small holding yard where the company had just enough room to place a couple of 40cyd skips. This plan was immediately refused by the university and hospital management due to the perceived noise and dust levels because of the close proximity of the children wards in the nearby hospital, instead, the company had to use the existing goods lift as sole means of removing all of the material from site. With the inside of the lift protected and suitable designated walkways from the ground level lift lobby to the goods yard defined, the company set about the soft strip. Windmill Group employed a specialist M&E contractor to carry out all service disconnections and isolations which they managed as Principal Contractor for the project. All electrical services to the sixth floor bar a temporary supply for lighting and power tools were disconnected along with the water and gas supplies entering the floor and a temporary water supply was installed at a later date to supply water for dust suppression purposes. The schedule of works put forward by Windmill Group to the University called for the demolition to progress within the working week only and while this was okay during the soft strip works, the demolition of the 950m3 of block work walls created noise and vibration above and beyond reasonable levels. To assist in the smooth running of the operation, Windmill Group management agreed to undertake some of the noisier and more disruptive operations on night and weekend shifts leaving just the clearing of materials to be undertaken during the daytime shifts. DEMOLITION by Paul Argent accredited operatives with handheld breakers before being removed in large wheeled carts to the lift. The original use of the floor was a medical research unit and at one time undertook animal research. To hold the test animals, a series of heavy duty steel cages had been installed and while the animal testing had been discontinued many years ago, they had remained installed until the demolition team arrived. Along with the animal cages, the company also had to deal with the removal of a large incinerator and boiler package once used to dispose of contaminated materials. To undertake this task the company decided to leave the room in which to plant was situated in place whilst the cutting operations were taking place. The surrounding block work walls were only pierced to provide access points for the ventilation fans and ducting to be installed to remove fumes and keep a flow of fresh air into the confined space. As with the rest of the demolition, the boilers and incinerator needed to be reduced to manageable pieces before being removed from the building. A team of highly skilled burners commenced the cutting of the units with great care being taken throughout the shift to ensure the risk of fire was kept to an absolute minimum. Senior Contracts Manager, Neil Garner explained that the relatively straightforward nature of the project was made more complex due to the fact that the floors above and below were in constant use throughout the period of the contract. The professionalism shown by his team on site has ensured the contract was completed without a hitch and to the full satisfaction of the main contractor and client. D&D for an exclusive view of their new demolition specification machinery at a site in Muswell Hill, North London. The site was being redeveloped by Northeast Demolition who are long term users of the Staffordshire manufacturers products and were kind enough to let the manufacturer have unrestricted access to the site and all the materials need to undertake a photoshoot for the new demolition brochure being produced for the manufacturer. Alongside the JS300XD the company had their largest wheeled loader, the 457. Equipped with material handling arms and straight edge bucket, the 457 has been designed for high productivity material handling and features the latest fuel efficient engine technology from an MTU diesel which meets current Tier4 emissions regulations without the need for any additional aftermarket treatment. The loader also benefits from ground level servicing points and is also fitted with the JCB CommandPlus cab which JCB claims offers an unrivalled driving experience. or an open canopy and is seen as a perfect tool for use in top down demolition projects. The recently launched midi range of machines were also featured with an eight tonne 86C-1 machine being demonstrated with two piece boom and HM386Q hammer. The two piece boom offers a larger working envelope compared to a standard mono-boom making the machine particularly versatile. The 86C-1 was also equipped with a three way hydraulic dozer blade. Although not a run of the mill option for the demolition industry, the blade would be very useful in the levelling of material at the end of a project. to ferry items around the site and while often overlooked as a production machine, the Loadall range provide a much needed back-up to some of the frontline demolition machines. As with the 300 skid steer, the Loadall was fitted with puncture proof tyres, ideal for working in the demolition industry. Northeast also had one of their own JCB machines on site, a JS220 which was working with a selector grab and have further increased their fleet of JCB excavators with the purchase of the JS300XD and its bigger brother, the 37 tonne JS370XD. Access online bidding, auction results and more Create a free account: it’s fast, free and gives you full access to our website features. rbauction.com/myaccount Ritchie Bros.’ website, rbauction.co.uk, gives a complete overview of all equipment in our upcoming auctions across the world. Check out the up-to-date auction calendar, browse through detailed equipment information and pictures, ﬁnd information about buying or selling at our auctions and get access to auction results of all auctions of the last two years. Complete a few easy steps to create a free online account. In just two minutes you can access all features the site oﬀers. THE LATEST FROM THE INSTITUTE Although only just over half way into the year the IDE have had a very busy time of it of late. Already we have welcomed 26 new members to the Institute with more expected to be enrolled in September. We have been pleased to see that our brand new Technician Grade (TechIDE) has been very popular so far, we have even enrolled a new member from Australia at this level. Quite a few of our current members have been applying for their Full Membership grade which means that a few of our Council Members, myself included have had a very full schedule of Professional Interviews to attend. It has been encouraging to see that the standard of portfolio has been high making them a pleasure to read. If you are thinking of submitting an application for consideration the deadline is 25th August. The IDE calendar of events continues to grow on a regular basis. We are already in the throes of organising Regional Meetings across the country with more to follow. Organisation of the Autumn Seminar in September and AGM/Annual Luncheon in November is already underway, the latter taking place at the prestigious Plaisterers Hall. Another Golf Day has also been booked for September so if you want to improve your handicap, socialise with colleagues and maybe win a prize then make sure you book this event soon. The IDE were extremely pleased with the success of the recent Demolition Expo 2015 that took place on 26th and 27th June 2015. The collaboration between the IDE and NFDC was outstanding and helped to make the event a huge triumph. We look forward to this being repeated in the future. Tough on t he job, gen nt le on t he surround ing s.
Our range of accessories ffoor Hus O H qvarna demolition robo b ts make evven en the most challengiing jo j bs b easier. Accessories incllude the DCR 100 and DCR 300 crushers, both can demolish a 400mm thick wall. Our steel shearer, the DSS 200 is ideal fo for work in conffined spaces and is capable of demolishing structures and piping. HUSQVARNA CONS STRUCTION PR RODU ODUCTS UK Tel: 0844 844 4570 - Web: www.husqvarnacp.co.uk - Email: husqvarna.construction@husqvarna.co.uk Copyright ÂŠ 2015 Husqvarna AB (publ). All rights reserved. Environmental provide safe and compliant transportation for the removal of soil and stones containing dangerous substances from Highbury & Islington Station. Transport for London (TfL) is replacing the A1 Highbury Corner Bridge to ensure its continued safe usage and to avoid any further unplanned closures or restrictions. Hazardous waste removal company, Gilpin Environmental Ltd, sister company of Sam Gilpin Demolition, was contracted by Hochtief (UK) Construction and TfL as part of this ongoing works at the Highbury & Islington Station which sits on the bridge. compliant and safe option for the containment and transportation of hazardous materials through public spaces and proved ideal for working within the confines of the vaults and the station’s restricted lift access. Hazibags and now see them as an intrinsic part of our waste removal and handling procedures.” The exclusive licence for Hazibags in the UK is held by NFDC Industry Service Provider, Windsor Waste Management. Paul Wood, Hazibag Manager, Windsor Waste Management says: “Hazibags provide a safer, easier, greener and more compliant way to manage solid hazardous waste and it’s great to see these benefits experienced by the demolition industry”. Hazibags are being used to demonstrate innovation and good practice in hazardous waste management on the Considerate Constructors Scheme (CCS) online best practice hub and have proved one of its most popular entries since its launch in January this year.